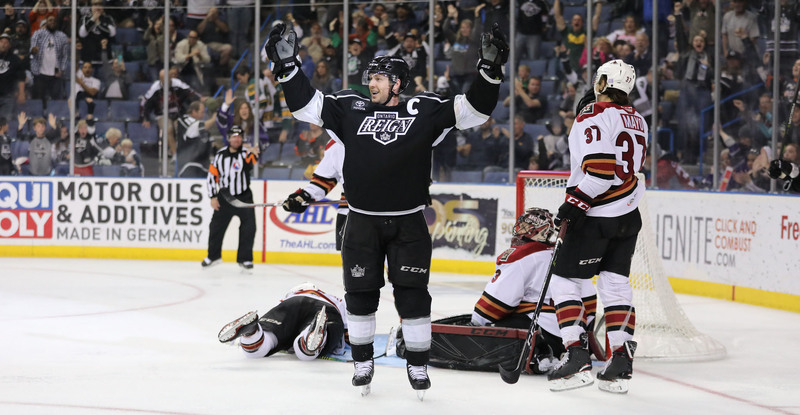 The Roadrunners, after responding to overcome two deficits, ultimately fell to the Ontario Reign by a 4-2 final on Sunday evening at Citizens Business Bank Arena. The loss, coupled with the Colorado Eagles’ 3-2 shootout victory over the Chicago Wolves, drops the Roadrunners to fifth-place in the Pacific Division. Tucson (74) sits one point behind Colorado (75) with three games remaining and one game in hand on the Eagles. As is the case year after year, cellar teams can be extremely dangerous this time of the season. 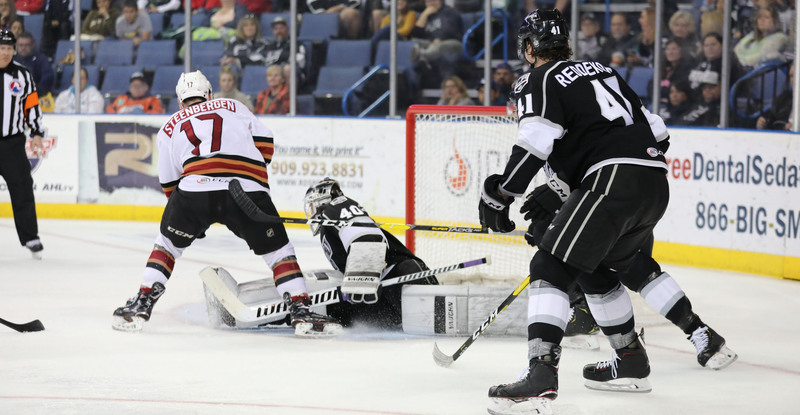 The 30th-ranked Reign proved to be the latest case. The Roadrunners fired away for 44 shots, but Cal Petersen was up to the task, especially in the game’s late stages. Ontario took its first lead with 3:37 remaining in the first period, but it would last all but 10 seconds. On the ensuing faceoff following the Reign’s opening tally, Lane Pederson drove to the net while on a two-on-one with Brayden Burke, shoveling home a back-door feed to tie the game 1-1 with 3:27 remaining in the first. Pederson, in registering his 21st goal of the campaign, became just the fourth player in club history to eclipse the 20-goal mark in a single season. With just over six minutes remaining in the second, the Reign reclaimed a one-goal lead. The Roadrunners executed in the final seconds of the middle frame to tie the game, Dakota Mermis scoring his second goal in as many games with a power play strike from the point after retrieving an Ontario clear from the neutral zone. Mermis’ goal, his third of the season, ties his career-high mark set during his rookie campaign in 2015-16 with the Springfield Falcons. Despite the Roadrunners outshooting the Reign by a 19-7 count in the third period, Ontario was the only team to find the back of the net, doing so twice to secure a 4-2 win. Adin Hill stopped 28 of the 32 shots he faced in suffering his 13th loss of the year. “It was a tough game for us, obviously we’re in a playoff run, we’re trying to make a push here to get into a spot at the end, so it was just disappointing that we couldn’t pull it together and get a game that we needed,” Fasching added. The Roadrunners will put the finishing touches on their four-game road trip Wednesday night against the Bakersfield Condors at Rabobank Arena, where the puck is scheduled to drop just after 6:30 PM PST.